Influenced by the owner's stay in Barcelona, the house has a new sunny and whimsical addition. 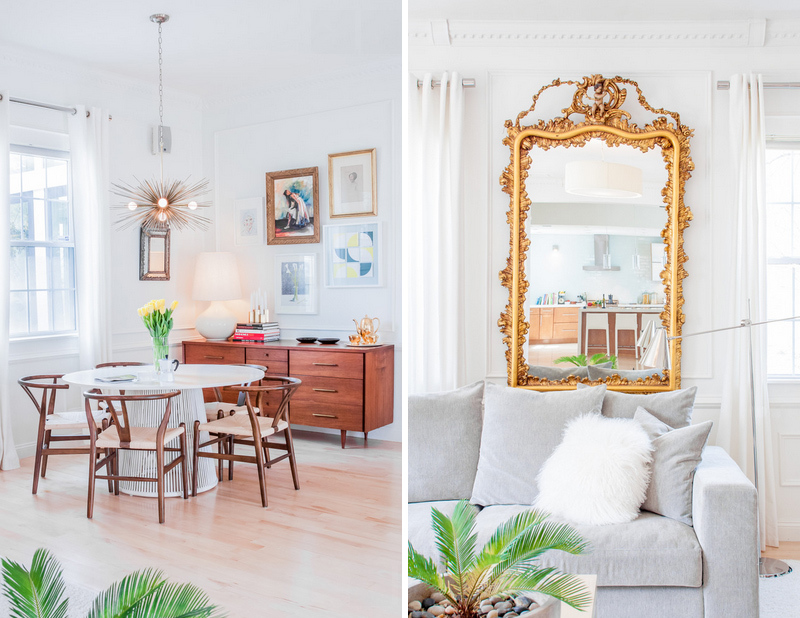 Owner and designer Melissa Miranda has fond memories of growing up in a home with a conservatory located in London. According to her, she loved the smell of the plants and having breakfast in there. 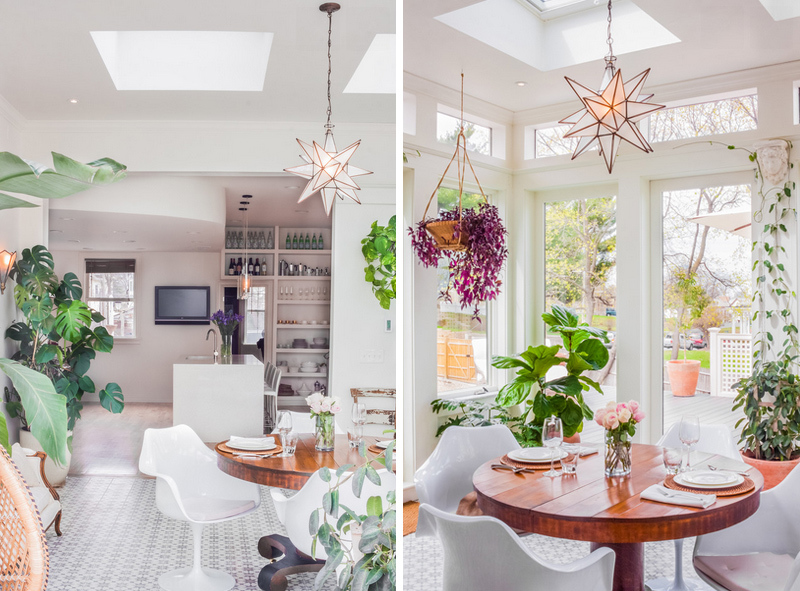 When she returned from Barcelona after a year, she decided to add her very own sun-drenched conservatory to the converted carriage house that she shares with her builder husband, Ulises Serret, and son Alex. Part of the house was a room that Miranda designed and Serret built. They redecorated the space to give it a European Bohemian style, operable skylights, Barcelona-inspired tile and radiant-heat flooring. The house is located in Dorchester neighborhood of Boston with 2,400 square feet (222.9 square meters) floor area. It has 2 bedrooms, 1½ bathroom. 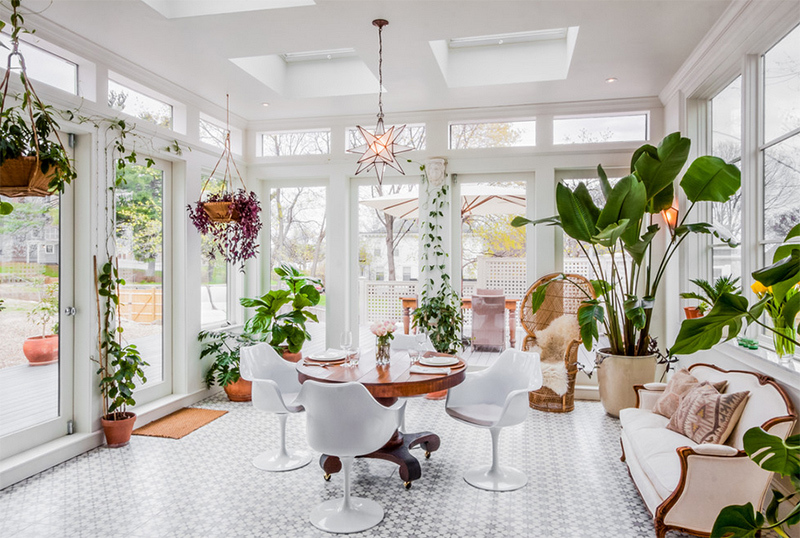 Numerous plants are seen in the area which is the most used space of the house since it is where the family eats breakfast, lunch and dinner. “I can’t imagine what it’s like living without that room now,” Miranda said. The conservatory occupies space that once was a deck. What keeps the space warm and comfortable the whole year is the radiant heat beneath Barcelona-inspired floor tiles. “A house is not a home without plants,” Miranda said. “I’m verging on an obsession with them. I talk to them. It’s a thrill seeing them grow and flower.” The home was once a Victorian carriage house that was built in the late 1800s. The space looked really stunning and whimsical! Aside from the interesting design of the furniture, plants surround the area. You can see here different types of plants in various containers or planters. And yes, the white color fills the space with more light especially that it has windows all around it. You can see here Miranda’s first redecoration of the space with added gray walls and created a much sleeker, more modern look. For her latest redecoration she wants it to have a more natural feel. “In Boston we get terrible long, cold winters. You get a little bit of cabin fever, so I wanted to have a lot of light and plants to combat the winter blues,” said Miranda. 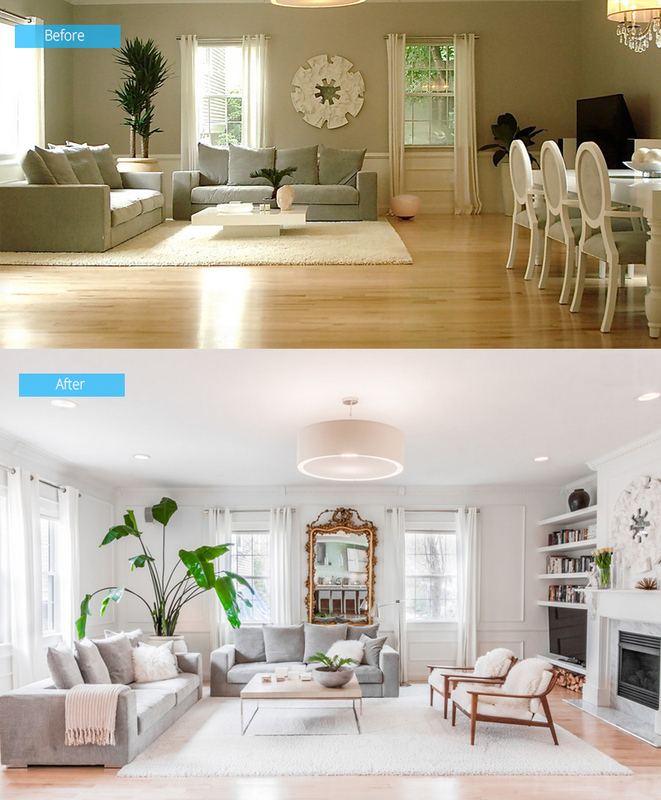 The process started by painting the entire house including the walls, ceiling, and trim with Swiss Coffee by Benjamin Moore which is her favorite of all whites. 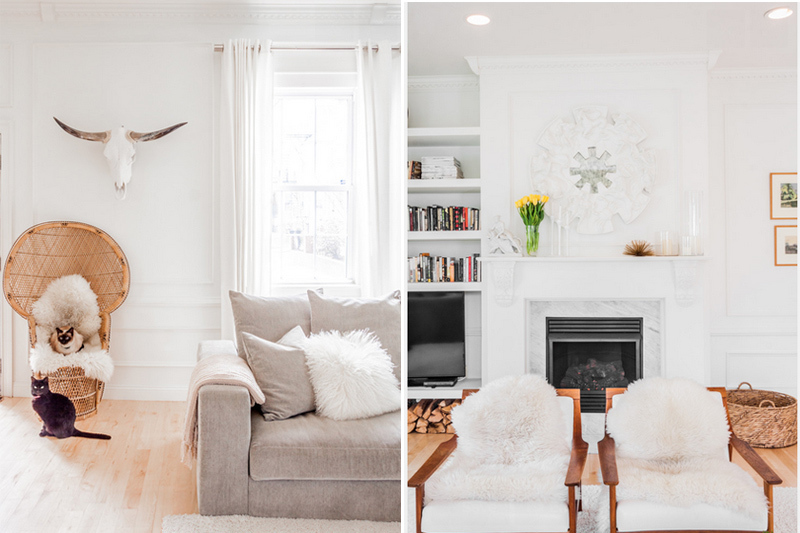 “There’s a touch of green and yellow, so it feels cozier and gives a clean, bright white studio look without being cold.” The overall color of the house accentuates the openness of the area with traditional moldings. The space has a Mediterranean influence where she added custom-size carpet from a local shop. It finished on the edges to create a large area rug that now sits on the maple floors with a water-based finish. In the middle of the room is a large pivoting turntable. Reproduction tulip chairs were used around a rosewood table. Wheels were installed on the table so that it can easily be moved out of the way when Miranda feels like dancing. She could stretch out the settee when she wants to read. The settee is bought by her mother at an estate sale on Cape Cod. She had the Moravian star light with milk glass custom made through a Mexican company. During warm days, the family can open the skylights with a special stick. The kitchen used to be a three horse stable with copper trays beneath them for collecting urine. 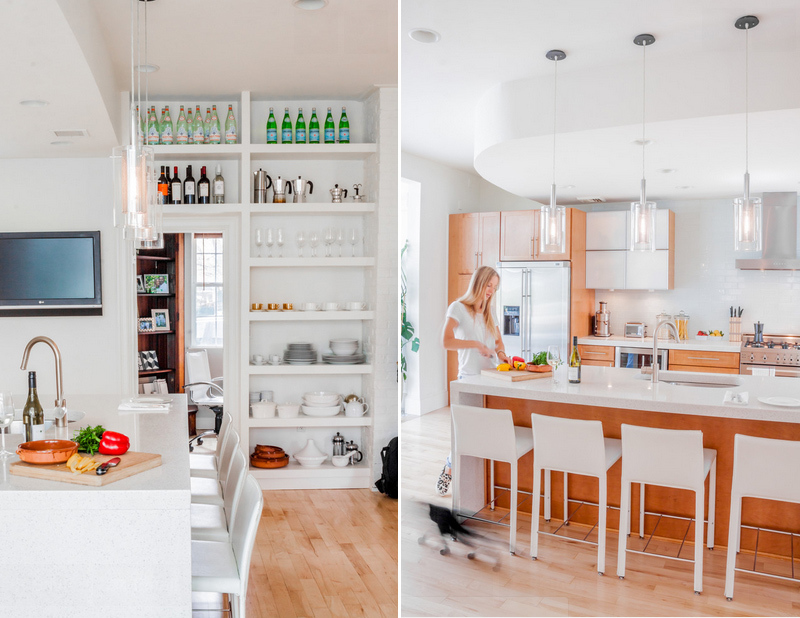 When they redesigned the area, Miranda put her own touch on things like reformatting the cabinets from an L-shaped layout to just one wall to give it a more modern look. White quartz was also used instead of black granite counters. 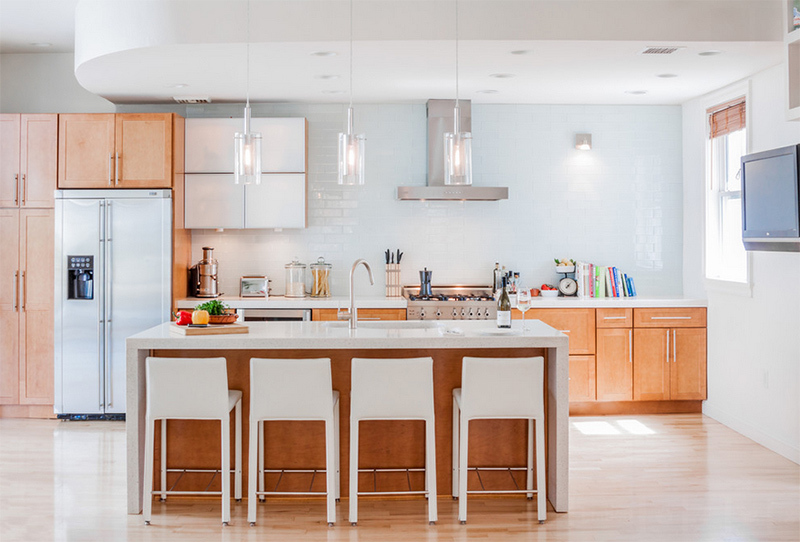 The island countertop has waterfall edges on both ends. The Italian mirror was bought from an antiques shop in Barcelona’s bohemian neighborhood, Gracia. Isn’t it a lovely piece in this area? It sure is! On the other photo, you can see reproduction wishbone chairs that surround a midcentury-style table in the dining area that is located just off the living room. This narrow, crooked-ish staircase is an original feature of the carriage house. Steel rails were just added to it that can be removed easily in order to get large furniture pieces upstairs. The railings bolts can be unscrewed. 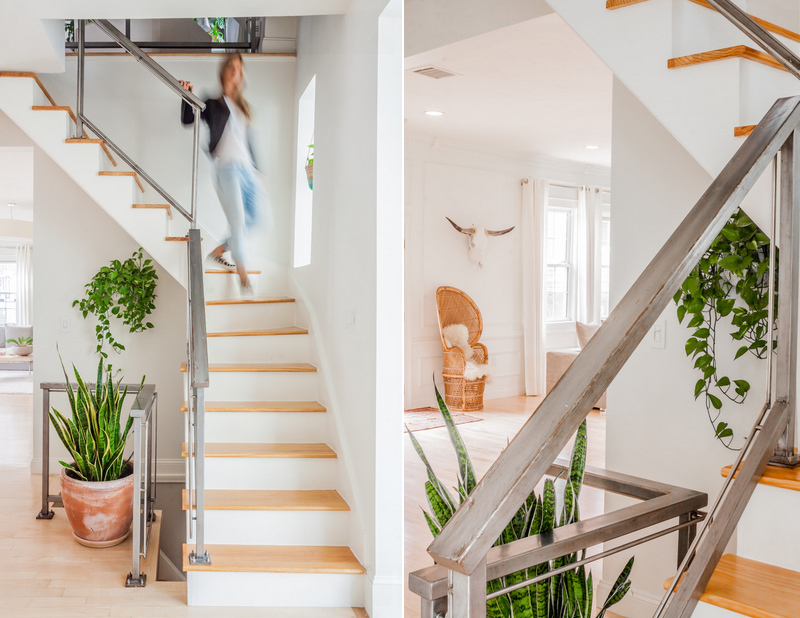 Under the stairs is a type of philodendron that doesn’t require much light. There is also a snake plant that fills a terra-cotta pot nearby. “They can live in virtual darkness,” Miranda said. This master bedroom used to be a hay barn which explains why it is very huge. It has a simple, fresh look that is in line with the spirit of the rest of the home. 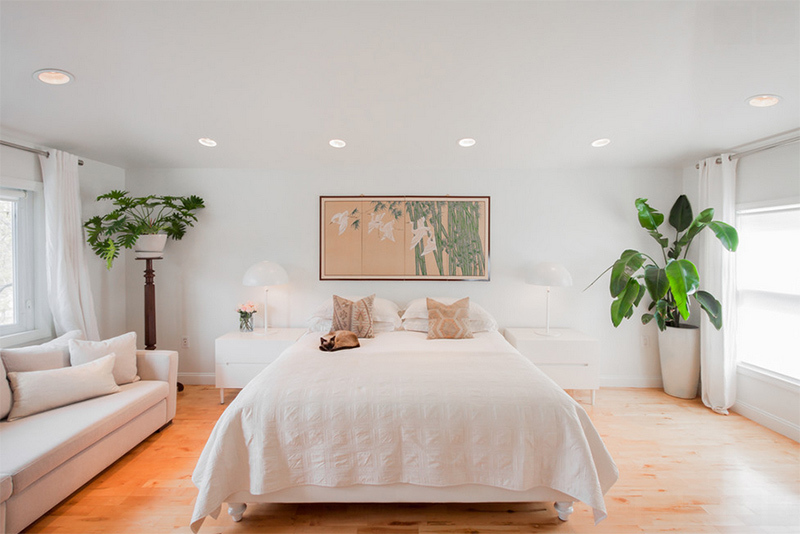 “I always like the bedroom to be very simple and white — a nice, calm space, without tons of things going on,” she says. You can also see here a 10-foot sofa which the couple bought in Barcelona. Meanwhile, Miranda’s mother brought the two kilim pillows back from a trip to Turkey. The artwork on the wall is hand painted on silk. I can say that this conservatory is really gorgeous! I love how it brought the beauty of nature inside it by adding plants. Putting the plants in different ways from those on pots and hanging ones is a good idea. Also, you can see that a variety of types, sizes, colors and height were added to the space. This home is designed by owner Melissa Miranda Interior Design who gave it a touch of its own home when she was still younger. The space turned out really stunning and cozy. I also like the mix of furniture used in the area too. What can you say about this whimsical home redecoration? It sure is a stunner in whatever corner we look into!